We provide LaFiDa for applying Simultaneous Localization and Mapping (SLAM) algorithms. 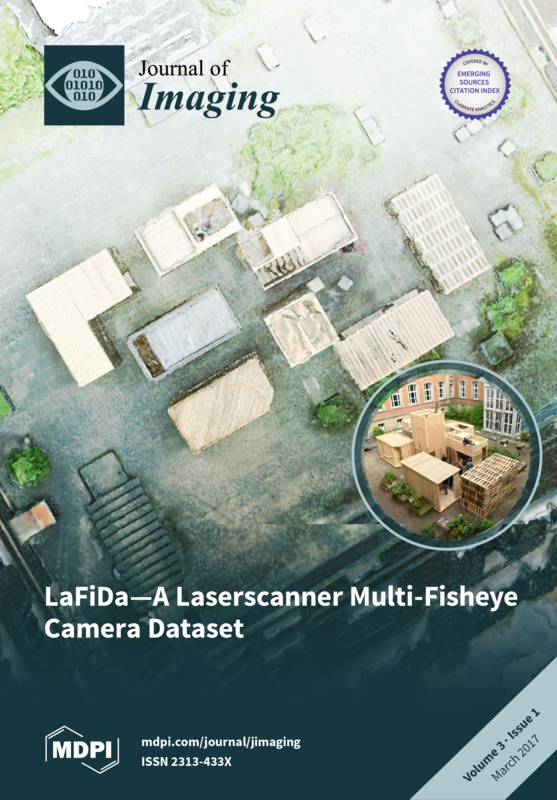 The Laserscanner Multi-Fisheye Camera Dataset includes fully synchronized laserscanner data, three image sequences captured with fisheye cameras and reference data. The Laserscanner Multi-Fisheye Camera Dataset (LaFiDa) is captured with a laserscanner combined with a Multi Fisheye Camera System (MCS), both mounted on a helmet. For evaluating the pose of the laserscanner and the MCS a tracking system is utilized. The acronym LaFiDa base on the italian term "la fida" which stands for trust/faithful. 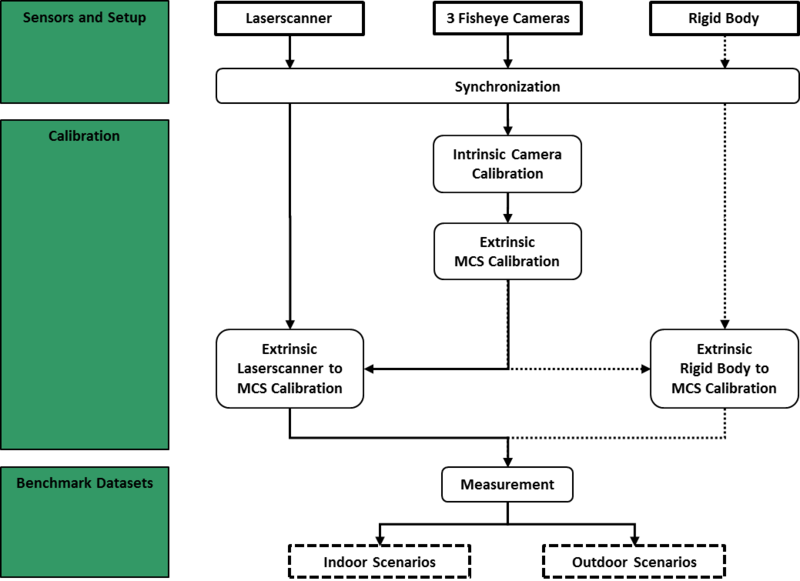 The ground truth trajectory is gained by measurements of a motion capture system (OptiTrack with 8 cameras), henceforth called tracking system. For operating the tracking system a rigid body is utilized. In this context, to increase the visibility of the rigid body, a specific designed rigid body is developed. The rigid structure contains three spherical markers, covered with retroreflective tape, all arranged on an aluminum bar. With the tracking system we receive an accuracy for the rigid body position of a few tenth of a millimeter for a stable setup. For dynamic measurements the accuracy is about a few millimeters. For a proper aligment of the sensors against each other and successful measurements all utilized sensors have to be synchronized. In order to achieve a reliable synchronization, time stamps were used for each captured image and each laserscanner line. With a precise counter (HiResTimer) all sensors can be synchronized and assigned. The intrinsic camera calibration is necessary to preprocess the obtained data and to determine the exterior orientation of the whole helmet system. Therefore the interior orientation of each camera is calculated by using the Ocam-Toolbox. Further the intrinsic orientation of the MCS is calculated, the relative orientation of the MCS has to be determined. With fixed control points in form of binary markers, where the position is given by the OptiTrack system, the positioning of every single fisheye camera can be reprojected to control the calculations. The extrinsic calibration between laserscanner and camera is derived by both front cameras (left and right). The aim is to get the pose (rotation and translation) between laserscanner and one camera, respectively MCS. The calibration enforce aquisitions from various points of view to a textured calibration plane, henceforth called checkerboard. For linking the MCS to the rigid body by rotation and translation between both coordinate systems, the exterior and relative orientation of the systems to each other have to be determined. The origin of the coordinate system of the rigid body is set on the first spherical rigid body marker. Several indoor and outdoor scenarios have been captured. The indoor scenes show static (Indoor_static) and moving (Indoor_dynamic) areas of interest. The outdoor scenes are recorded in a courtyard by rotating the helmet system around the center of the system (Outdoor_rotation), moving the helmet system with a crossing trajectory (Outdoor_static & Outdoor_static2) and moving the helmet system with loop closure (Outdoor_large_loop). To evaluate the estimated camera trajectory the captured data can be collated with the ground truth and therefore different metric methods are availible. A set of tools, provided by the Computer Vision Group TUM, is used to compute the absolute trajectory error (ATE) and the relative pose error (RPE).